Robert Knigge was one of the first settlers in the city’s new urban frontier — the San Francisco Shipyard, a relatively affordable housing development going up on the site of the old Hunter’s Point Naval Shipyard. The Shipyard is part of a big (by recent standards) condo-building boom in San Francisco. Citywide, there were 1,200 new units available in September, up 83 percent year over year, according to data from The Mark Co. Most of the new projects are single high-rise buildings in established areas, with units priced at $1,200 per square foot and up on average. The Shipyard, by comparison, is a collection of mid-rise, low-density buildings (all named for ships) with townhomes and condominiums averaging $800 per square foot, according to developer Lennar. Many have spectacular views of downtown San Francisco and the bay, although those go for more than $800 per square foot. All units come with one or two parking spots, which is good because there are no shops, restaurants or supermarkets within walking distance. The only public transit is the 19 Muni, although Lennar runs a free shuttle to Caltrain and T- Third Street light rail stations and downtown. The development one day will cover 500 acres jutting into the bay on the city’s southeastern waterfront, with 220 acres of parks, open space and athletic fields. “We have entitlements for up to 6,500 homes,” said Sean Sullivan, Lennar’s sales director. Phase one, called Hilltop, will have 950 units and be completed in two and a half to three years at the current pace of construction, Today, about 150 units are occupied, and about 25 are for sale. “The market has modulated in San Francisco, especially new construction,” Sullivan said. Like most developers, Lennar is doing a “controlled release” of new units so as not to flood the market. Prices start in the high-$500,000s for a one-bedroom condo. At the high end is a three-story, 1,430-square-foot, end-unit townhome with three bedrooms, two and a half bathrooms, small yard, deck, views, 11-foot ceilings and side-by-side parking. It’s listed at $1.28 million, or about $900 per square foot. All units, regardless of price, have quartz countertops and tile backsplashes, stainless steel Bosch kitchen appliances, gas cooking, in-unit washers and dryers, hardwood and carpet. Buyers cannot choose finishes. Some buildings, even four- story ones, lack elevators. Each condo unit comes with one parking spot in a communal garage. Townhomes have private garages for two cars, usually parked tandem. Homeowner association dues range from $210 to $250 per month for townhomes and $350 to $500 for condos, but condo fees include water and gas. Knigge, who works in sales for Marriott, bought a two-bedroom condo with about 1,000 square feet for $755,000 in May, 2015. Ten months later, a larger unit became available. So he sold his first one for $860,000 and bought a three-bedroom, 1,300-square-foot townhome for $1,060,000. The crane, called the Gantry, was used during World War II to lift giant guns off of battleships. It dominates the Shipyard skyline and serves as its logo. Because of the way his unit is situated, “I will always have a water view,” Knigge said. And the worst part? “There’s nothing around,” he said. There are no gyms, pools or businesses on site except for the Store House, which sells fresh-brewed coffee and essentials such as bread, milk and eggs. There are plans to turn Crisp Avenue into a sort of Main Street with shops and restaurants, but for now there are none. The closest grocery store is the newly opened Duc Loi Pantry on Third Street, about 2 miles away. Knigge shops at the Safeway near AT&T Park, 31⁄2 miles away, because it has free parking. The closest public school is Malcolm X Elementary, about a mile away. Knigge’s daughter attends a private school near downtown. He is one of the few residents with school-aged children. Most are young singles or couples — some with preschoolers — and empty-nesters, Sullivan said. Sullivan said that 10.5 percent of the units in each Hilltop building will be reserved for low- and middle-income buyers, as part of the Mayor’s Office of Housing Below Market Rate program. In addition, Lennar is transferring four Hilltop parcels to the city, which can develop them into BMR buildings with units for sale or rent. One of the four parcels has already been developed into the newly opened Pacific Point apartments. The Shipyard grounds are graced with outdoor sculptures, some made by artists who rent space at the nearby Shipyard Studios. Lennar is building another studio complex for artists, along with a new commercial kitchen for the Eclectic Cookery. Photographer Nigel Poor has had an artist’s studio at the Shipyard for three years. Last year she and her husband Rick Peterson, operations director at the San Francisco Museum of Modern Art, bought a two-story, 1,000-square-foot Shipyard townhome for $670,000. 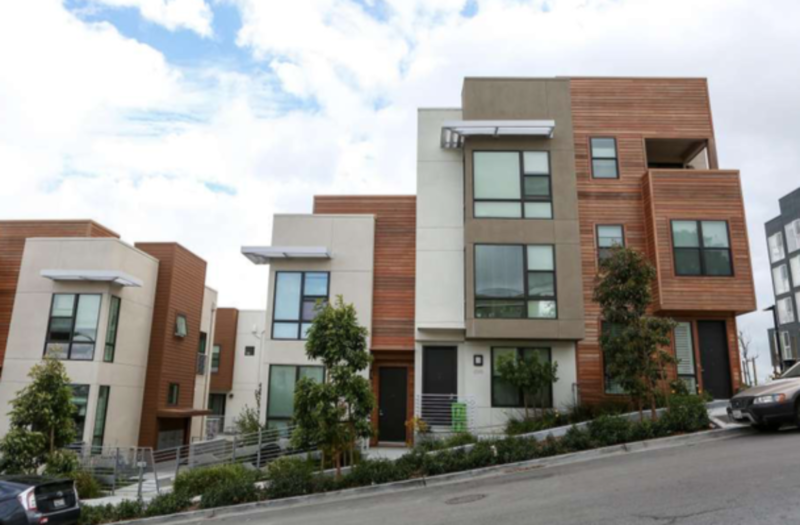 “We were renting on Potrero Hill and just felt like we were getting priced out,” she said. The average price for resale (existing) condos in San Francisco has averaged $1,009 square foot this year, according to CoreLogic. When the Shipyard first opened for sale, the most common question was “What’s up with the environment?” Sullivan said. Most of the former naval shipyard remains a Superfund site, with the Navy responsible for cleanup. Parcels of land are transferred for development only after the U.S. Environmental Protection Agency and its state partners have agreed that cleanup is complete. The Hilltop property was taken off the Superfund list in 1999. Lennar acquired it in 2004 and began infrastructure development. “As more and more people have come out here, it has become less and less of an issue,” Sullivan said.